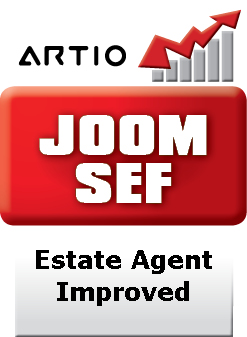 This Joomla SEO extension for ARTIO JoomSEF enables generation of Search Engine Friendly (SEF) URLs for the Estate Agent Improved component for Joomla. This extension requires ARTIO JoomSEF 3.3.x or newer (if you need 2.x compatible version, please see other category). Use the JoomSEF built-in extension installer to install the extension package. After installation, purge already existing URLs for VirtueMart component and clean all caches (JoomSEF, Joomla)! For more details on JoomSEF extensions installation, upgrade and configuration, please check JoomSEF Paid Extension Information guide and JoomSEF documentation. Thanks to Estate Agent component authors, newest version of the extension is now available under GPL/GNU license. It can be also downloaded for free in our Downloads section or online using JoomSEF Extension Manager.